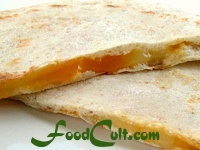 Sandwiches - Free, Easy Recipes @ FoodCult.com - A Place for Galganov's Recipes and More - Food Matters! Sandwiches can be prepared on so many mediums. They can be on a flat-bread - rolled or folded in. A sandwich can fill a pita pocket, it can be a filling between to slices of plain white bread, a rich, multi-grain bread or any kind of roll. A sandwich can be bathed in sauce or be prepared "open-faced" (a spread, piece of meat, or vegetable, for example, on a single slice of bread usually eaten with a knife and fork). Sandwiches are almost always convenient to eat - just pick them up and feed yourself. Some of our sandwiches are traditional while others may be our own sandwich innovations ... ideas you might use as the catalyst to help you create your own favourite sandwiches! Try our traditional sandwiches and our sandwich innovations ... a fun way to enjoy a meal-on-the-go ... or a convenient, nutritious, home-made meal.